Women in Leadership Media Campaign – Funded by USAid, the Women in Leadership Media Campaign was developed to enhance the GEL project. The project researches traditional women’s leadership roles and stages a media campaign based on that research using television, print, radio and newspapers. The Women in Leadership Media Campaign also preserves traditional knowledge through the collection of interviews. 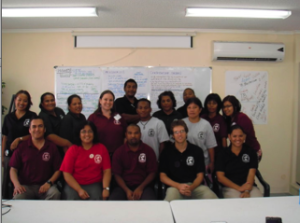 PROJECT GOAL: “To reduce alcohol, tobacco and drug use in the Marshall Islands”The substance Abuse Prevention Project (Bobrae Project) is underneath the cooperative agreement between Ministry of Finance, Republic of the Marshall Islands and the Substance Abuse and Mental Health Services Administration (SAMHSA) from the government of the United States of America. SAMSHA have awarded RMI for 5 years to help reduce problems caused by substance abuse and to implement strategic prevention activities in communities and villages throughout the atolls. The grant funding called Strategic Prevention Framework State Incentive Grant (SPF SIG) and for Prevention only. Bobrae Project was started on July 1st, 2009 and ended on June 30, 2013. Reduce the onset and reduce the progression of substance abuse, including childhood and underage drinking. Reduce substance-abuse related problems in communities. Build prevention capacity and infrastructure at the state and community levels. Under this project, there are 10 coalitions from the different atolls in the Marshall Islands. 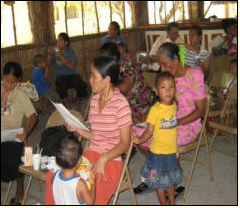 Sustainable Livelihood Project (SLP) – Funded by UNDP (United Nations Development Program), the SLP is a pilot project aimed at creating income generating opportunities for the outer island women of Ailinglaplap, Jaluit, and Maloelap Atolls in the Marshall Islands. 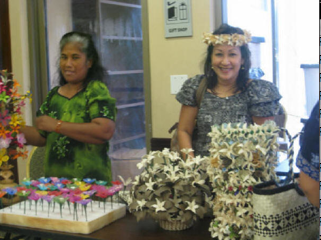 Specifically, SLP purchases, distributes and sells Marshallese handicrafts in Majuro and Honolulu. 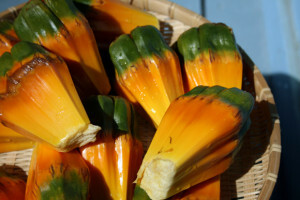 For many of the families of the outer islands, selling handicrafts is their primary source of income. This project marks a successful beginning for future revenue-generating opportunities of handicraft distribution abroad. SLP is also supported by the Small Grant Program, which funds sustainable growth of the raw materials used for handicrafts. Bõb Festival 2009— WUTMI held the first Bõb (Pandanus) Festival, honoring our local food and culture. WUTMI partnered with local businesses and local groups to organize the multi-day event which included a spelling bee, traditional games, cooking and weaving demonstrations, and music. WUTMI is dedicated to reviving and celebrating traditional culture and hopes to make the Bõb Festival an annual event. Capacity Building— Funded by AUSAid, the capacity building project has improved the infrastructure of the WUTMI office while also increasing the skills of the staff. WUTMI is providing computer lessons to staff and members and will use those lessons to form a manual which can be shared with local partners. TIPS (Training for Improving Parenting Skills)– An extension of PAT, TIPS is funded by the PRIDE Project, through the Ministry of Education, a continuation of the project funded by New Zealand, and also partially funded through the Rongelap Atoll Local Government. This project aims to better guide young parents on proper parenting skills for young children (prenatal—kindergarten). 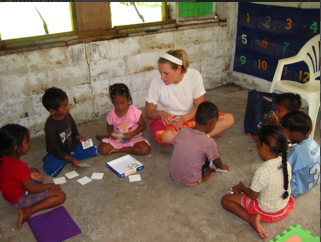 TIPS recently expanded to serve 120 young parents of children 0-5 years of age in Majuro. This project also aims to enhance the capacity for local governments regarding parenting knowledge and training skills. 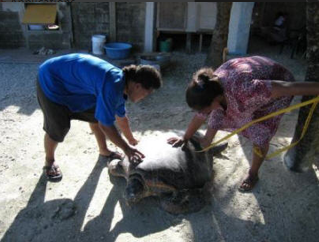 Turtle Project – Funded by NOAA and University of Hawaii, this project gathers information on turtle usage in several atolls as a means to track their movements within the Pacific and to educate communities on the importance of managing sea turtle resources in the Marshall Islands. In it’s third year of this data collection project, the Marshall Islands ranked #1 among all data collectors in the Pacific. By training local women to gather genetic samples and other data, this project not only provides income for the collectors, but also serves to build their personal skills. Millennium Development Goals – In 2001, the RMI became party to the United Nations Millennium Declaration. 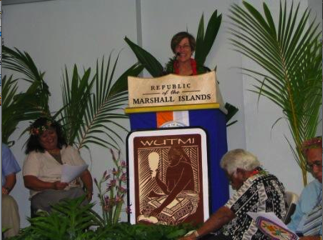 By ratifying the declaration, the RMI Government pledged to its citizens (and the world) that it would pursue a number of development goals and targets, with significant emphasis on poverty reduction. 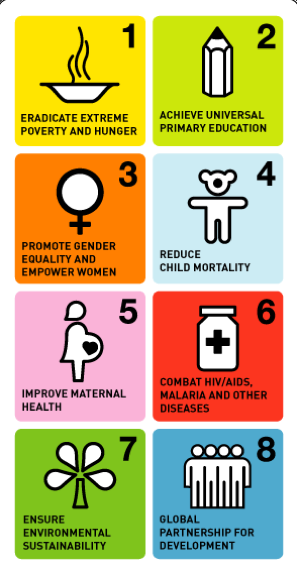 In the declaration, eight major goals entitled the Millennium Development Goals, or MDGs, were identified, each with a set of targets. ADMIRE PROJECT- a GEF-UNDP funded project implemented in the Republic of the Marshall Islands through the Ministry of Resources and Development. 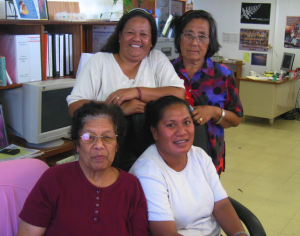 WUTMI was responsible for a short term consultancy for the design, procurement, construction and distribution of solar dehydrators for the women of Arno Atoll. The project provided training on the use of the product. This Project was implemented in consultation with the WUTMI Chapter of Arno, which provied supervision on the ground support. The dehydrator is to help women make products that they can feed their families or sell to earn income as a community or as a household. Training will occur at each of the following communities: Arno, Ine, Matelen, Jabo, Ulien, Bikarej, Rearlaplap.